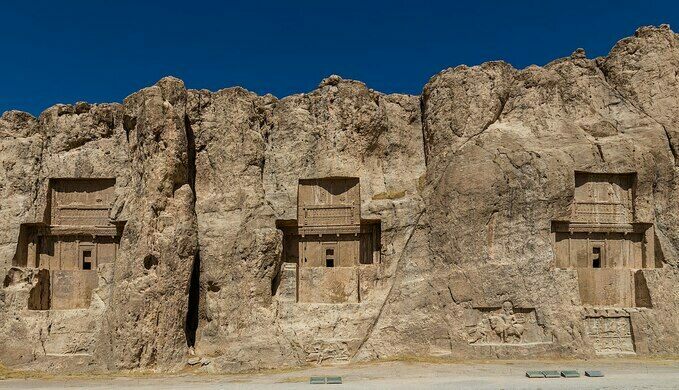 The ancient necropolis houses the immense rock-cut tombs of four Persian kings. Naqsh-e Rustam is an impressive necropolis that stands as a reminder of the once famous and powerful Achaemenid Persian Empire, which thrived between 500 BC and 330 BC when it was defeated by Alexander the Great. 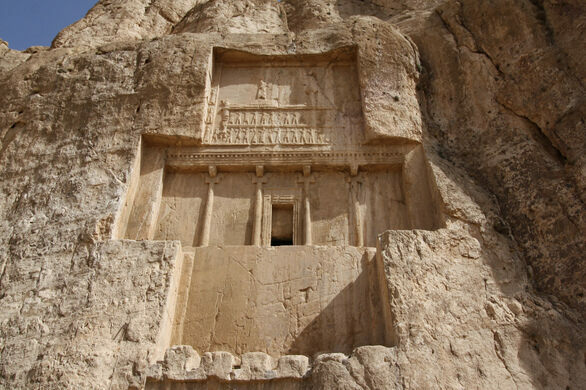 The complex has been somewhat overshadowed by the nearby ancient capital of Persepolis, but this royal necropolis does stand out as a magnificent example of ancient Persian architecture and art. 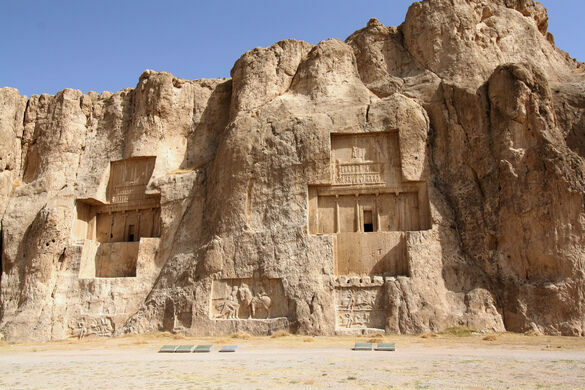 The tombs are hewn into the rock at a significant height from the base of the hills, and bear the resemblance of crosses, hence the site is locally known as the “Persian Crosses.” The necropolis consists of four rock-cut tombs holding the remains of Achaemenid rulers. Only one has been identified with certainty: the great Persian king, Darius I. Archaeologists believe the other three kings buried here are Xerxes I, Artaxerxes I, and Darius II. At the centre of the cross are openings leading to the chamber where the sarcophagi may have been placed. In fact, it is not known whether the bodies were directly placed in a sarcophagus inside the tombs or if the bones were collected from a Tower of Silence and subsequently placed in the tombs, in the traditional Zoroastrian ritual. Above the openings of each tomb are carvings of kingly figures being anointed by god-like creatures. There are other rock carvings below the cross-hewn tombs commemorating various battles that brought the Achaemenid dynasty to prominence. 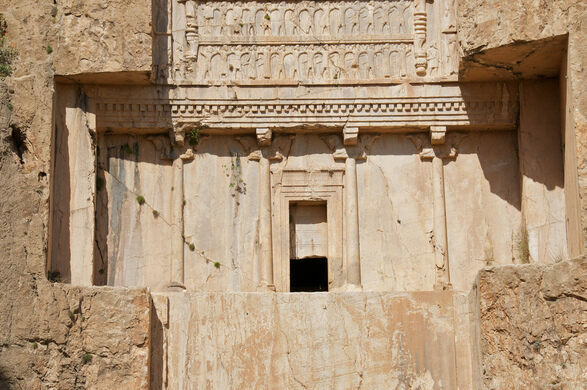 One carving actually seems to predate the tombs, suggesting that this ancient site had been used by people even before the Achaemenid Persian Empire. Aside from the tombs, a building also stands at the necropolis. 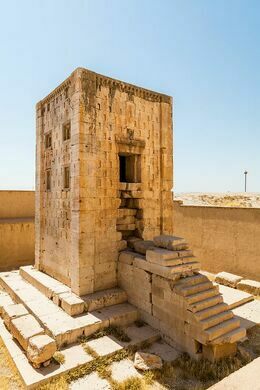 Called Ka’ba-ye Zartosht, (Cube of Zoroaster), it is a replica of the Zendān-e Solaymān (Prison of Solomon) in Pasargadae, the first dynastic capital of the Achaemenid Empire. It was once thought that this structure was the site of a perennially burning fire common in Zoroastrian temples, but the lack of ventilation suggests otherwise. Although there is currently no consensus as to the specific use of this structure, it is widely accepted that it served a religious function. On the walls of this building are relatively well-preserved inscriptions in three languages. This ancient burial site is believed to be one of the first earthquake-protected structures in the world. A sprawling ancient Jewish cemetery with over 30 rock-hewn burial caves. Ancient rock-cut tomb? Definitely. That of a great Median king? Unlikely.